MINUTES OF 10TH AUDIT COMMITTEE MEETING OF TRIDEV INDUSTRIAL WORKS LTD. HELD ON FRIDAY THE 29TH AUGUST 2016 AT 10.00 A. M. THE CORPORATE OFFICE OF THE COMPANY AT 9TH FLOOR, BERGER HOUSE, 210, PARK STREET, MUMBAI-400025. Shri Pratap Shanker Trivedi was elected to the chair and the meeting proceeded with the presence of the quorum. Authentication of Annual Accounts of the Company for the year ended 2016-2017. The Audit Committee Considered and approved the Annual Accounts of the Company for the year ended 31.03.2017 which was circulated amongst the members of Audit Committee. 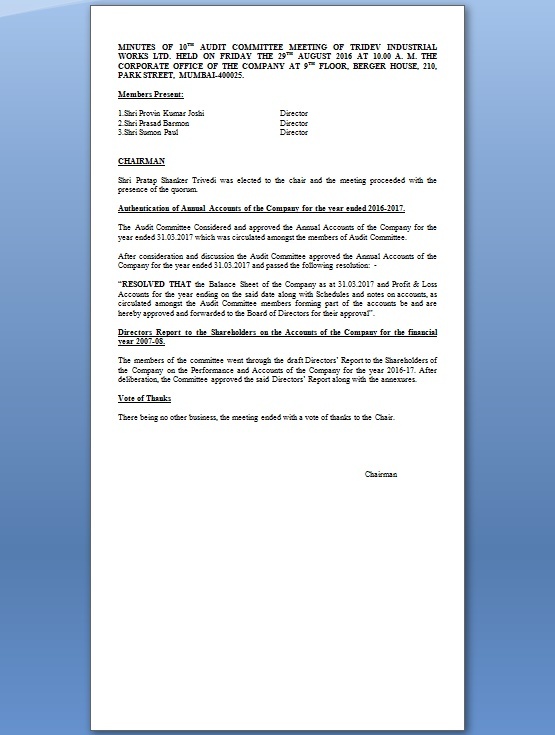 “RESOLVED THAT the Balance Sheet of the Company as at 31.03.2017 and Profit & Loss Accounts for the year ending on the said date along with Schedules and notes on accounts, as circulated amongst the Audit Committee members forming part of the accounts be and are hereby approved and forwarded to the Board of Directors for their approval”. Directors Report to the Shareholders on the Accounts of the Company for the financial year 2007-08. The members of the committee went through the draft Directors’ Report to the Shareholders of the Company on the Performance and Accounts of the Company for the year 2016-17. After deliberation, the Committee approved the said Directors’ Report along with the annexures. There being no other business, the meeting ended with a vote of thanks to the Chair.